Monday, August 4 was a flurry of activity in Stonington, CT and Weekapaug , RI as the Eastern Connecticut Sailing Association (ECSA) MudRatz packed up their boats and headed to Newport, RI for the 2014 U.S. Optimist Dinghy Association New England Championship, hosted by Sail Newport August 5 – 7. Chris and Braedon Hansen were the advance team, securing a good location in the boat park for 16 Mudratz Opti sailors and their boats, four coaches, three coach boats and a boat for parent spectators. A huge field at Fort Adams was covered by 419 Optis within a short dolly push to the beach for launching. Sail Newport was well organized with registrations broken down alphabetically, and the kids were quickly registered and out sailing for some practice. It is hard to appreciate how to handle a fleet of hundreds of Optis, but Sail Newport makes it look easy with their great organization, army of volunteers and a great system for quickly getting more than 400 boats on and off the water. Although most of the MudRatz had not sailed a major regatta with this high level of competition, they were soaking up the experience on and off the water and having a great time. The mission of the MudRatz is to complement the local sailing programs offered by the yacht clubs of the region by enabling enthusiastic sailors to practice in the spring and fall as well as travel as a team to regattas around the country. The MudRatz team for the New Englands range in age from 9 to 14 and are all experienced racers in ECSA events, so they sailed in the Red, White and Blue fleet (RWB), which was 376 boats! The team consisted of Chris Annino (Blue), Brook Barry (Blue), Tristan Chang (Blue), Tyler Chang (Red), Harvey DeMovick (White), Caelan Desmond (Blue), Lily Flack (Blue), Jamie Fox (Blue), Megan Gimple (Red), Austin Halsey (White), Braedon Hansen (Blue), Margot Hutchins (Blue), Duncan Manthous (Red), Sasha Oakes (Blue), Evan Spalding (Blue) and Ryan Travers (Blue). 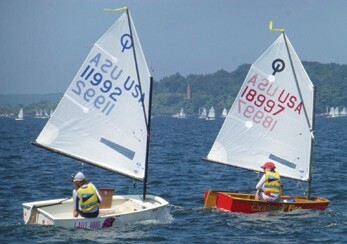 Red, White and Blue raced together, but were randomly split each day into four color-coded fleets of almost 100 boats each. Tuesday, the first race day, many MudRatz drew the yellow fleet which headed out and raced last. The racecourse was north of the Newport Bridge between Potters Cove and Gould Island. There was good breeze and they completed three races in each fleet over the Opti Trapezoid with Reach Finish course designed so the multiple fleets would not mix together. Given the four fleets, this amounted to 12 races in one day, a great job by the race committee. This was a long day with some pretty tired sailors falling asleep in their dinner. Wednesday they shuffled the fleets, but breeze was hard to come by. The race committee completed one set of races and tried to finish the second set but was thwarted by shifting and dying winds, leading to the third race of the set being thrown out and thus the whole second set of races on Wednesday were thrown out by the RC. A nice social event at the after-race carnival included a rock climbing wall, bungee trampoline, coach dunk tank, weigh-in contest, snow cones, lemonade, popcorn, hot dogs, hamburgers and pasta. Thursday started with hopes for two races so everyone could get a throwout once six races were completed. As this was the last day, the first race of a set of four could not be started after 2:30pm. The seabreeze was slow in starting, but the RC succeeded in starting the second set of races just before 2:30, making a total of six races per fleet for a total of 24 RWB races! The late start on Thursday made for another long day as the team broke down their boats. The line to pull coach boats at the ramp was impressive. The Mudratz packed up and attended awards, where Lily Flack’s Lady Bug and Evan Spalding’s Dragon Fire won second place and third place, respectively, in the ‘Best Boat Name’ contest. Thanks go to our coaches, Jon Faudree, Justin Diekerhoff, O.J. O’Connell and Ally Melvin. Many parents pitched in here and there, but Chris Hansen, Tori Gimple, Tim Desmond, and Harvey DeMovick put in a huge effort in Newport all week. And of course none of this would ever have happened without Brandon Flack and his tireless organizing, promoting and execution of a great vision to expand our sailing world. We would also like to thank the ECSA, Morgan Stanley – Canning Bergendahl Group, and the Mystic River Mudheads. Without their support this team would not be possible. 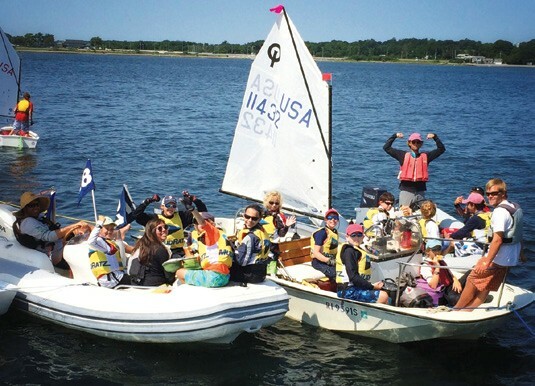 The MudRatz fall session, comprising six weeks of small group coaching in Optis and 420s, started September 7 at Niantic Bay Yacht Club in Niantic, CT. Niantic Bay YC and MudRatz are hosting the Connecticut State Optimist Championship on Sunday, October 19. For more information, contact Brandon Flack at bflack@amconet.com or visit mudratz.com.